In this beloved meditation shared on Day 10 of the Hridaya Silent Meditation Retreat, Sahajananda offers an inspiring reminder of Unity. Hridaya Meditation includes 3 main elements: centering in the chest area, an awareness of the breathing cycles, and asking the question “Who am I?.” This one-hour meditation is perfect for beginners and experienced Hridaya Meditation practitioners alike. A 40-minute guided meditation for the Revelation of the Spiritual Heart is the perfect way to start the day. Sahajananda’s calming voice and strong presence allow us to sink deeper in the awareness of the Stillness beyond all thoughts, sensations, and emotions. Sahajananda gives a thoughtful introduction to Kashmir Shaivism and the Vijnana Bhairava Tantra. 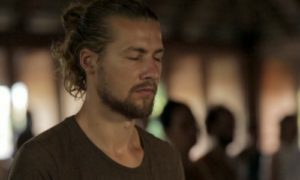 This lecture is a precursor to the Art of Awareness workshop that Sahaja offers annually at our home in Mazunte, Mexico. If I am God, Isn’t Consecrating to God a Contradiction? Is it Necessary to Practice Hatha Yoga before Meditation? Can I just use the Techniques that Work Best for Me? Beginning in Module 2 of the Hridaya Yoga Retreat, we practice Rhythmic Breathing. This involves performing the entire yogic breathing cycle (inhalation, full retention, exhalation, and void retention) according to a fixed count. The practice of Rhythmic Breathing can induce exceptional states of consciousness. Below, we offer recordings to accompany the practice. The recordings use beeping sounds to mark the rhythm. Each time the rhythm changes there is a distinct sound signaling the shift. The sequences are listed below. A document containing the list of sequences may be downloaded here.